Aron Crowell: With the rounded toe, are they hunting snowshoes? Trimble Gilbert: Yes, hunting snowshoes. 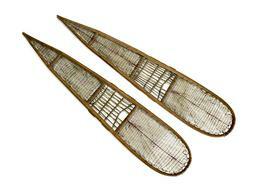 Eliza Jones: Yes, these are walking snowshoes with really fine babiche [sinew]. (2) A long time ago, people were really observant. And if you came across somebody’s track on snowshoes, a lot of times they could recognize whose track it was by the way the snowshoe is made and used to know people’s track, personal track. And when they’re filling in this part [mesh], you try not to leave any ends sticking out. And they’d say, “Oh, I saw so-and-so’s track today. Looks like he was dragging a spruce tree.” And that’s because the strings on this person’s snowshoes were sticking out, so it made trace lines on the track. Aron Crowell: Those are so flat. Eliza Jones: Well snowshoes, when they get older, they tend to, if they get wet long, then they tend to straighten up out there [tip]. Trimble Gilbert: In springtime for storage, you can tie them together the other way—this facing this way and this one the other way [back to back]. You tie them together there, then soak it a little bit, and then put a stick between there [curved tips]. And then fall time, everything is the same [retains curve]. But if you leave it like this [front to back] out in damp weather, then it’ll straighten. Aron Crowell: How do you bend the wood in the first place? Trimble Gilbert: Well a long time ago, they used their knee. You use the hot water to steam it, and then bend it like this [flex repeatedly across knee]. Then you can go ahead and put it like this [shape into tapered oval frame], then put this one [netting] between it. It’s hard, really hard [work]. Eliza Jones: I saw Butch Yaska, he tied these snowshoes together facing opposite directions after he makes a pair. And then he put a wedge in between the two [down from tip]. And then out here a little bigger one, then a little bigger one, and then out here a big one [wider wedges toward tip], until it’s just the right curve. And then he let it dry like that. Aron Crowell: When you’re making the loops inside the frame, isn’t so that the bottom of the snowshoe is completely smooth, so there’s no strings that are coming down on the bottom, so that it can just glide along the snow? Eliza Jones: It’s about mid way [holes in frame] all the way around. Trimble Gilbert: Nowadays, [there are] a lot of tools to work with. A long time ago, when you had to make holes on these, you had to use the—what did they call it? Trimble Gilbert: Yes, awl. They used bone, sharp bone, and caribou antlers. Eliza Jones: They drill one hole this way [from outside], drill it in so far, and then they drill on the other side [from inside to complete the hole]. Then you pull the string through, and it comes out on the other side. Trimble Gilbert: You have to use water on the babiche. Then dry it, and it’s strong. Aron Crowell: Was there a division of labor between men and women for making snowshoes? Trimble Gilbert: Just the men. Eliza Jones: Nowadays, men like George Albert in Ruby, he does the whole thing, even this part [fine netting]. But a long time ago in our area, the women filled in this part [fine netting at front end] and this part [fine netting at rear end], and then the men filled in this part [coarse netting at middle]. Because for this part [netting at middle], it takes more strength to do it. Trimble Gilbert: I drew it there [tapered oval with hole at center]. This is aih vàl [snowshoe lacing needle]. This is for that [netting], the needle. Eliza Jones: I call it oyh bełtl [snowshoe lacing needle]. I remember, when I was a child, they were making this with bone. Trimble Gilbert: At the middle is a hole, that’s where you put the sinew. Eliza Jones: You go up and down [to make the netting]. Trimble Gilbert: Some people really do it fast. 2. Babiche—strip(s) of rawhide, sinew or gut used for sewing, lacing or fastening—is a word adapted from Canadian French and originally from Algonquian. Among Athabascans, it is usually made from untanned caribou hide.